I grabbed the sketch for this card from somewhere on the internet (that’s like saying, “I found this credit card on the floor somewhere in Walmart), but for the life of me, I can’t find it! If you recognize it, please let me know so I can give proper credit. 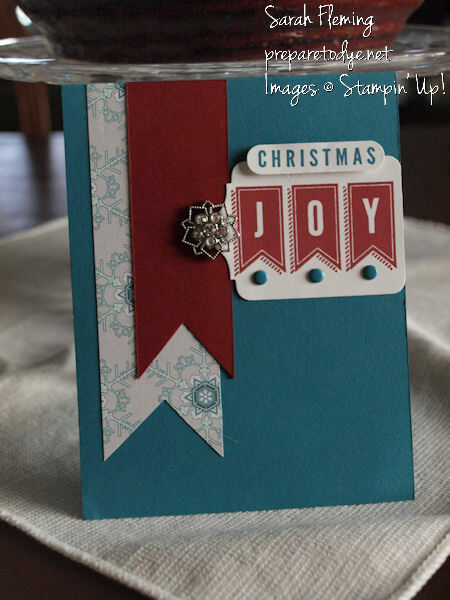 Island Indigo and Cherry Cobbler are probably my favorite Stampin’ Up! colors. Seeing them together makes my little stampin’ heart happy. So when I decided to make my first Christmas card of the season (I made this before the Santa card and before Convention), I knew they needed to go together. The JOY banner and the little Christmas word window are from A Banner Christmas, one of the new stamp sets coming out in the Holiday catalog — this set has a lot of excellent stamps for both cards and scrapbooks. I love the Island Indigo Candy Dots. Perfect to fill that little bit of white space below each flag. And do you spot that wonderful little silver snowflake? That is one of the Frosted Finishes embellishments from the Holiday catalog. They are even prettier in person! So much fun to use. And that’s it. Simple card with a little flash.